Politics under Salvador Allende was a battle fought in the streets. Everyday attempts to “ganar la calle” allowed a wide range of urban residents to voice potent political opinions. Santiaguinos marched through the streets chanting slogans, seized public squares, and plastered city walls with graffiti, posters, and murals. Urban art might only last a few hours or a day before being torn down or painted over, but such activism allowed a wide range of city dwellers to participate in the national political arena. These popular political strategies were developed under democracy, only to be reimagined under the Pinochet dictatorship. 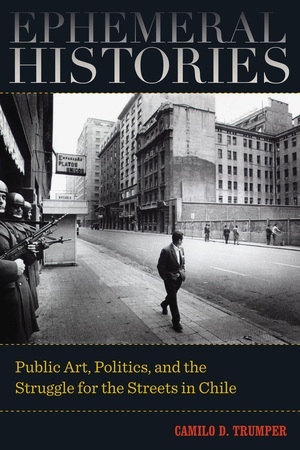 Ephemeral Histories places urban conflict at the heart of Chilean history, exploring how marches and protests, posters and murals, documentary film and street photography, became the basis of a new form of political change in Latin America in the late twentieth century. Camilo D. Trumper is an Assistant Professor of American Studies and Latin American History at the University at Buffalo, SUNY.